A few years ago, I bought the Harrisville Designs 7″ potholder loom and a big bag of cotton loops. I helped the grandchildren make potholders as holiday gifts for their parents. 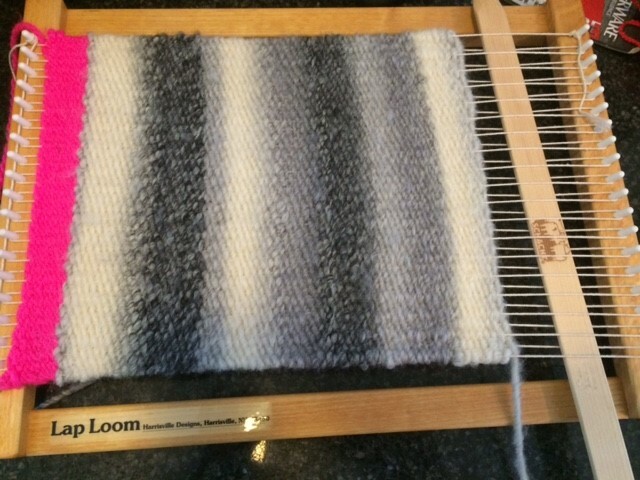 After we got home, I warped the Lap Loom for Granddaughter F using a natural color carpet warp. The pickup sticks were, oddly, made of balsa wood and the stick shuttle was only 4 inches long. So out we dashed and bought a nice, strong Schacht pickup stick and a longer stick shuttle. I made several yarn suggestions, and Granddaughter F – the lover of all colors pink – surprised me by selecting a spaced dyed wool-acrylic blend worsted weight yarn that was not pink! Granddaughter F started with a header of some pink yarn and then switched to her yarn of choice. There was no beater in my daughter’s house, so as you can see from the picture to the right, Granddaughter F used a fork as a beater. By bedtime, Granddaughter F had woven half of the project! 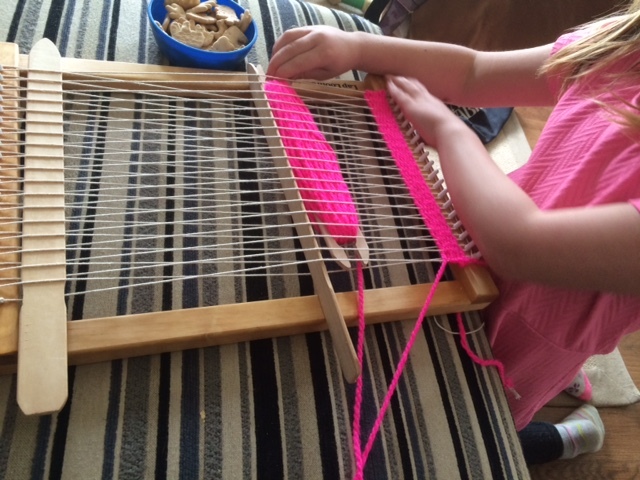 At that point, Granddaughter F surprised me by saying she wished she hadn’t woven with any pink. I explained that we could hide the pink in a seam. Toward the end of the following morning, however, the shed had gotten so narrow it was difficult for her to weave (for me too). So I said I would take it home with me and finish. We discussed what she wanted me to make it into. A purse? A blanket for one of her dolls? A wall hanging? A pillow? She wanted a pillow. After I got home, using a long (long) crochet hook in lieu of a pickup stick, I finished the weaving, hand stitched the ends and removed it from the Lap Loom. After zipping it into a mesh lingerie back, I machine washed it (cold water, flat dry). 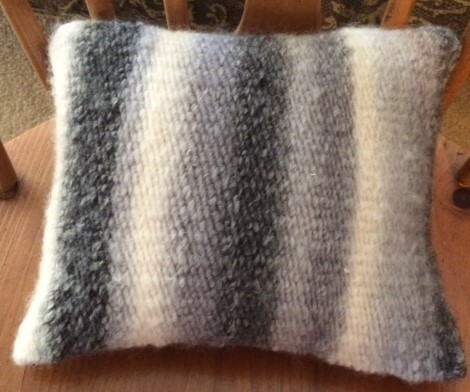 The pillow that Granddaughter F wove is now in the post on its way to her, along with her newly rewarped Lap Loom, two pick up sticks and a long shuttle along with the second ball of yarn she selected (same pattern, different color). It was a great weaving-teaching experience and a wonderful granddaughter-grandmother bonding moment. Don’t worry if you don’t have a beater. A fork not only works well, but Granddaughter F thought it was fun to use a fork for something besides eating! This probably goes without saying: Offer lots of encouragement and praise. 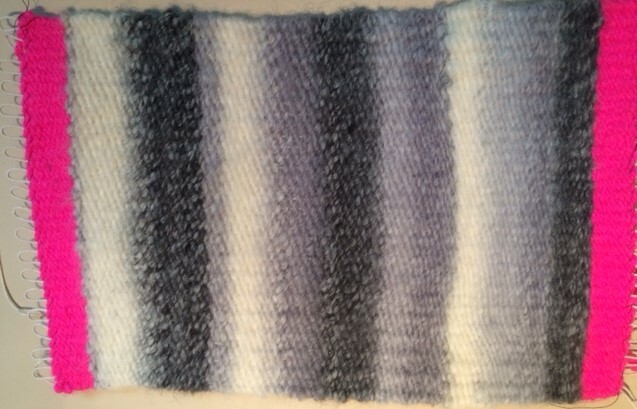 Share stories of your first weaving projects and weaving mistakes. Laughter defrays a lot of anxiety. 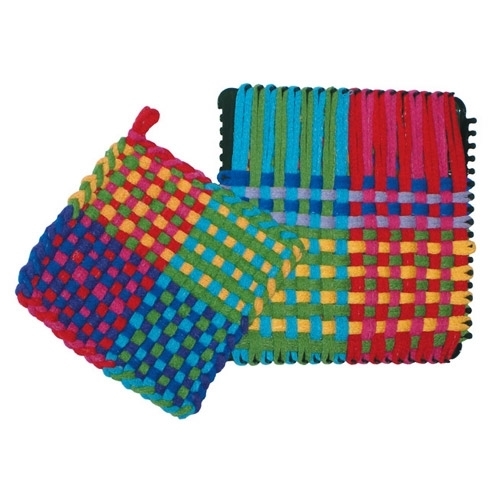 Turn the child’s first weaving project into something useful that she/he will use and/or see every day. Have you taught a child in your life how to weave? 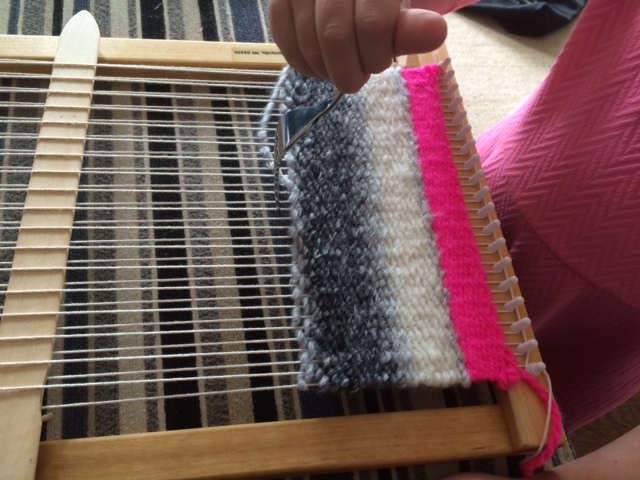 What have you found to be useful when teaching a child to weave?! What were the child’s first weaving projects? 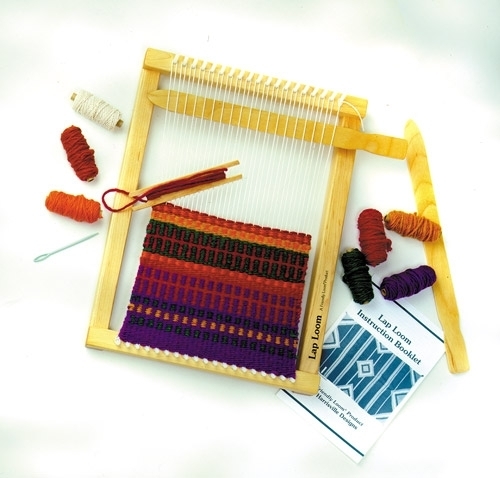 This entry was posted in Weaving and tagged Harrisville Designs, Lap Loom A. Bookmark the permalink. This sounds like it was a tremendous amount of fun and I love the idea of trying it with my daughters, I may have to wait a while yet though as the oldest has only just turned 2 years old. Great project and excellent result! My son has done paper weaving in prep and when we camp both my kids always make looms from forkedv sticks and weave leaves and grass. My son is not interested in weaving on any looms without a heddle now, since he discovered how easy they make weaving. I have looked for a little one with a heddle and even contemplated making a back strap loom but I think that may be crazy. Please tell your granddaughter that her pillow turned out absolutely beautiful and she should be proud!!! Makes me want to get one of those looms. I sold my 4-harness just a few years ago to a friend because I just didn’t have the time to work on big projects. I love how she persisted to a finish, and that you helped her make it into something useful! I’m sure her enthusiasm for weaving will continue knowing that the fabric can be made into beautiful pillows and other items by her loving grandmother! What a wonderful bonding session for you both. 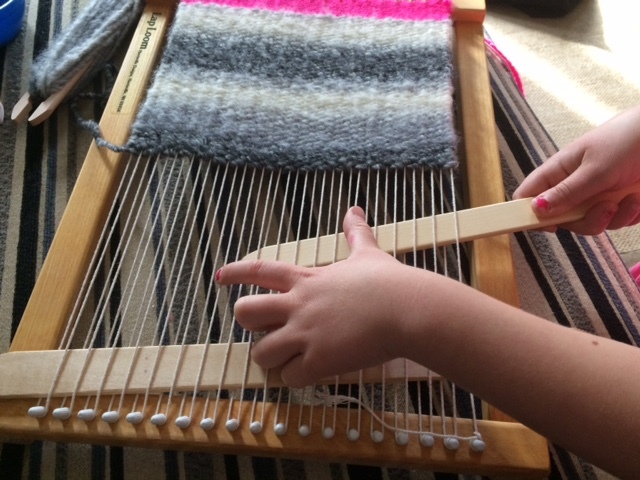 I have fond memories of weaving and this post has inspired me to make a loom for my granddaughter and teach her to weave. I’m glad. I’m sure you can make it fun for the children! A wide tooth hair comb – I wouldn’t have thought of that. Thank you! Thank you … though I’m sure, given your amazing design and sewing skills, you could turn a weaving into a pillow in short order! Well, children can be a little hard on pillows. I hope she likes it! WOW, you went above and beyond and did a spectacular job on the finishing of the pillow. That is good advice, make something useful! Such a Grandma. What a lovely post. 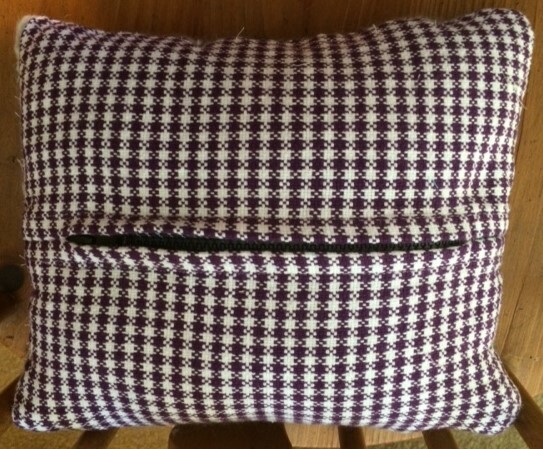 And what a great outcome – to make such a professional looking cushion. I hope to try this sometime. Sweet!! I haven’t been able to pass my crafts on to my daughter yet- I’m waiting for her to show interest, as anxious as I am to pass them on! I’ve been thinking about weaving projects for children, for a local arts center, and this is very helpful–thanks!